Cabin time is one of the highlights of a week at Young Life camp. If you've never led cabin time before or if you're just feeling nervous as you prepare to do it again, below are some ideas that will help guide you along with some cabin time questions you might ask. Be intentional about your training. 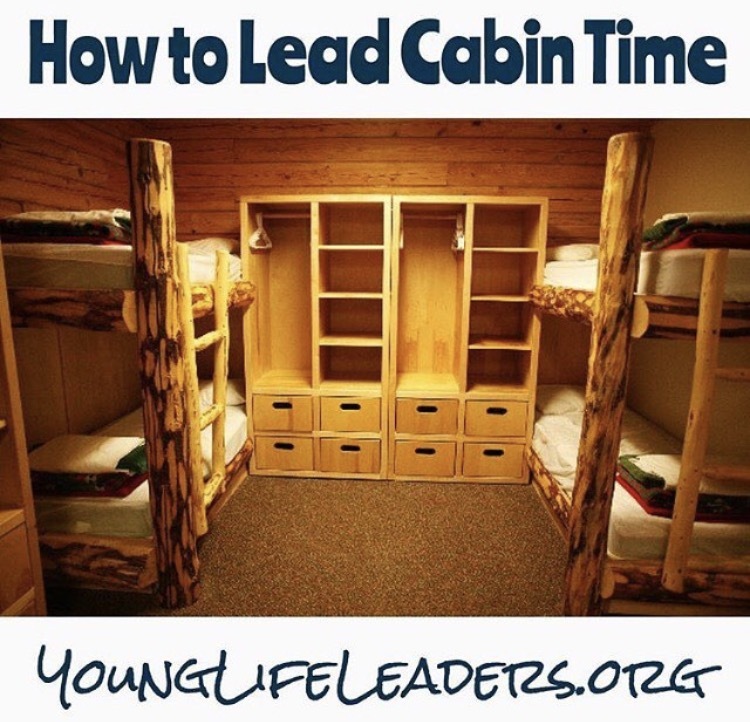 Meet with your Area Director/staff person or another experienced leader and ask them how to lead cabin time. Experience is the best teacher. You wouldn't go into the Olympics without training before you got there. A week at YL camp is going to feel like a marathon, physically and spiritually. Get physical and spiritual rest. Be with Jesus. Cast your cares and fears upon Him. Once you have spread mulch, washed cars, and sold doughnuts with kids to help them raise $ for camp, they are much more likely to listen to what you have to say. My pre-algebra teacher had a sign on her desk that said, "People don't care what you know, until they know that you care." Spend time BEFORE you get to camp earning the right to be heard. Head leaders serve on the assigned team to help you. If you feel overwhelmed, don't be afraid to ask one of them to come and sit in your cabin time with you. Our job as leaders isn't to use the cabin time to give another talk. Listen more than you speak. Don't fear the silence. Be patient. Invite everyone into the conversation.Try to open cabin time with a question that everyone can answer. Get folks involved who might otherwise just sit silently. I have a pocket-sized red notebook I carry with me everywhere at camp. I take notes during the club talk and during cabin time. I tell my cabin on night 1 that I'm taking notes because I want to be able to remember everything. It's super helpful to write things down that we're said in cabin time so you can follow up later with specific kids. I also use the notebook throughout the following school year to help me pray for kids. Your camp speaker will likely give you great questions to use in cabin time. Don't feel obligated to use all of them, they are just a guideline. Listen to the Holy Spirit and let Him guide your time. Don't stress if you feel like cabin time isn't what you had hoped. It's not your job to 'manipulate' kids, just create a safe place, set the tone, and trust the Holy Spirit to lead. Ask the Lord to give you an awareness of what's going on 'behind the scenes' with the kids in your cabin. Some of them are probably dealing with heavy stuff. On Night 1, it's ok to let the cabin time be brief and no super deep. After the cross talk on night 5, there will be some kids who want to have a four-hour cabin time and some that don't want to talk at all. Be aware of how the conversation is going. It is okay to end cabin time and ask a few individual kids if they would like to keep meeting. Often kids will go silent if you ask a direct question about them. Ex: 'What is the biggest temptation you personally face?' If you simply rephrase the question, for example, 'What do you think are some of the biggest temptations people your age face?' they will be more likely to speak up. If a kid cracks open a door to their heart, be sensitive. And when it's appropriate, ask them to tell you more. The simple phrase 'tell me more about that' will give kids permission to go deeper. Follow your camp speaker's lead as to when certain questions should be asked. Below are some of the best questions that have led to deep discussions in our cabin times in the past. 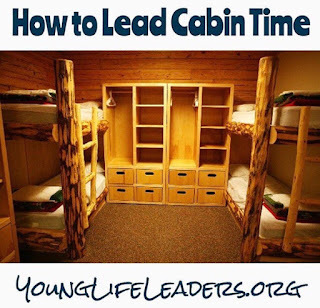 Here is a link to tons of cabin time questions collected by Sean McGever at YLHelp.com.